This is a BART service announcement. Elevators are out of service due to Godzilla. I just watched Gareth Edwards Godzilla. In it a gargantuan nuclear lizard battles randy sub-eating mantises around what used to be a quite serviceable part of San Francisco. This is a film that few would say failed to hit and then devour its mark, as far as spectacle goes. Its characters may have been preposterous, or paper-thin, or both, but Godzilla let loose with an assertive roar. 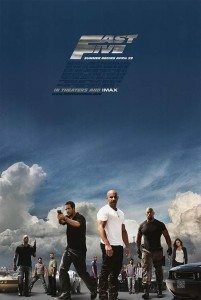 By which I mean to say it wasn’t quite as good as Fast Five — the latest in my foray through the Fast & Furious franchise. And yeah, I just went there. Because after Godzilla ended and I moseyed down to the BART station — in what used to be a quite serviceable part of San Francisco — I found I didn’t remember much from the film except for the alpha monster’s bellowing. It took me and the Dr/Mrs a few minutes to remember the main character’s name. In contrast, I have no problem remembering how thoroughly enjoyable — and thoroughly idiotic — Fast Five was even most of a week after I watched it. I remember the Rock and Vin Diesel playing monkey wrench tag; I remember an explosion lifting men off their feet in a primal blast; I remember tons of tumbling steel smashing through commercial establishments and parked cars. I remember, and I smile, for it appears I have reached the part of this franchise in which the films have clicked into their entertaining groove. Like it or not, I liked Fast Five. My comprehensive study of the F&F franchise has finally hit overdrive. That makes sense; this film representing fifth gear and all. Fast Five is the best of the series thus far. It more or less abandons what wasn’t really doing much for the franchise — that being illegal street racing culture — and keeps only what was working adequately — that being characters preposterous, or paper-thin, or both, but at least racially diverse. These thin characters are ones you’ve come to know — if you’ve been along on all of our fast and furious excursions thus far. Like your soft-in-the-head cousins who show up at every family reunion, you can’t help but feel tenderness for them. 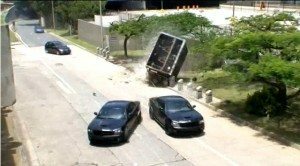 To up the octane, as is required of any new installment in a series, Fast Five adds Dwayne ‘The Rock’ Johnson, the most dubious heist plot this side of The Italian Job, and the kind of kinetic, practical action set pieces that make you want to watch the whole thing over again just to bask in the destruction. In Fast Five, things go boom. Like all sense of logic and reason. And your genetic resistance to films staring Vin Diesel. The movie begins just as Fast & Furious Four Real ends — with Toretto (Diesel) being hauled off to the slammer and O’Conner (Paul Walker) and Mia Toretto (Jordana Brewster) busting him out by smearing his prison bus across the asphalt. It’s a prison break that invokes all the tenderness of General Zod on a headful of PCP. The fact that anyone survives such a tumultuous wreck is a fair indication of how the film will continue. That being quickly, unsubtly, and with its stupid hat screwed on super tight. Somehow, after this jailbreak, O’Conner and Mia drive from the U.S. to Rio. I assume they just jumped the Panama Canal and the Darien Gap with their totally bitchin’ magical car. I am only sorry that scene wasn’t included in the film. Once in Brazil they connect with Vince, who it took me some time to recognize as part of the gang in the original The Fast and the Furious. Toretto is traveling on his own because mumblemumblemumble but he’ll be here soon. From the favelas, our heroes zip out to make some quick bread by stealing some cars off a train — a moving train. Cars, we are instructed, are easy to flip for a good profit in Brazil. Never mind the part about them being on a moving train guarded by DEA agents, or American DEA agents being in Brazil, or asking where these cars are being transported to in the first place. Please hold all questions until the end so we can ignore them concurrently. It is only important for you to know that O’Conner, Mia, Vince, Toretto, and some moustache-twirling villains are going to cut away the side of a moving train car, drive up alongside in a monster truck kind of thing, and snap the cars out like your drunk college buddy trying to rip the tablecloth off the banquet without upsetting the wine glasses. Well, the wine glasses get upset. One of the cars is full of magic beans and Mia makes off with it much to the main bad guys’ chagrin. He expresses his discontent by killing some DEA agents and forcing O’Conner and Toretto to drive off a kilometer high bridge, in an expensive car, splashing safely into a river that is, luckily, patrolled, at that very moment, by bad guy henchmen. I say luckily, since it is this perfectly reasonable coincidence that allows Fast Five to have a plot. Also, spoiler alert, Mia is knocked up, so, you know: family, you guys. Okay. Raise your hand if you know how to find the money. Anyone? Can we Google it? So there you go. Toretto gathers everyone who has ever appeared in any of The Fast and the Furious series films (Matt Schultze from the F&F; Ludacris and Tyrese Gibson from 2 Fast 2 Furious; Sung Kang from Tres Fast Tres Furious; and Gal Gadot, Tego Calderón, and Don Omar from Fast & Furious Four Real) to pull off this mega-heist. It’s a Fast and Furious parfait of endearingly uncomplicated character types! Hot chicks on bikes? Check. Witty and dashing African-Americans? Check. Comically disagreeable Latinos? Check. Red-blooded, thick-skulled, muscle-bound lugs of indiscernible race? Check and mate. For here comes Dwayne ‘The Rock’ Johnson as the guy who the guys call when the super secret guys call after they’ve called the mostly secret guys and are told the job is too difficult, dangerous, and diabolical for guys who use telephones that aren’t on fire and infested with space lice. The Rock’s character, Luke Hobbs, always gets his man. Always. Are you his man? It doesn’t matter. He’s already gnawed off your fingers with his grandma’s false teeth and made a cute little hand-turkey thing out of them. No one kills a DEA agent in his town, or in Rio, or shut up. For the rest of the film two things happen. First, Hobbs and Toretto play addled cat and stupid mouse while Toretto puts together the kind of heist plan that Houdini wouldn’t attempt if he was invisible and could fart skeleton keys. Second, they totally abandon that heist plan for one of the most testosterone-rich chase scenes in cinematic history: two lunkheads in American muscle cars dragging an 8′-square steel vault through the streets of Rio at high speeds. Yer out! Yer safe! Yer safe is out! Third base! Say what you will about this franchise, or about Vin Diesel, or style over substance director Justin Lin, or even screenwriter Chris Morgan — this sequence is stupid good. This film is stupid good. It is stupid and it is good. You do the math. There’s practically none of the dumb, boring street racing that bogged down the rest of these films. Instead, this is a straight up caper picture with a big cast of familiar faces. It’s Ocean’s Eleven on steroids. Vin Diesel may be just as terrible as always but The Rock makes up for it. He is so enthusiastically macho he should be in Flash Gordon wrestling Hawkmen in Sky City to the strains of Queen. The rest of the cast? They exist! Including now third fiddle Paul Walker. Sorry Paul! The actors — if male — get a few lines to demonstrate their character trait: tetchy, brash, suave, fertile, whatever. If they’re female, they also get to demonstrate their possession of rounded lady bits. There are on the whole, however, fewer scenes of unnamed women in skirts too short to cover a plucked eyebrow. Fewer, but still some. Let’s be frank, though. No one wants to see Vin Diesel in a short skirt. That is the stuff of nightmares. Now, maybe I’ve been watching too many of these films (read: all of them). Maybe I’ve been drinking just the right combination of industrial solvent and baby oil. Maybe the Fast & the Furious franchise has laid mind eggs in my cerebellum, and now those eggs have hatched to take over my typing fingers. But, even if all that is true (it is), I still really enjoyed Fast Five. I wanted to watch the final chase sequence again immediately after the film ended. And I honestly forget, until just this very moment, to mention that actor Paul Walker was killed recently, in real life, when the car he was racing in lost control and slammed into a light pole. I had always known that accident was tragic, and ironic, but I never really felt the loss of the man until now. For my insensitivity, I apologize. How could I know that these films would end up being better than Godzilla? I began my journey through this franchise as a cynic, but I am now a convert. I am honestly looking forward to Fast & Furious Six and sort of sad that the seventh film may be the last. I told you! I told you. They worm their way in right in to your heart. Like heartworm! And by my dope & bourbon soaked recollection, six is way better than five. But we were like yelling really loud through the whole thing in the opening-weekend sold-out theater, so your home mileage may vary. I’m just glad I’m watching them in this order. You must have suffered through increasing disappointment watching them from newest to oldest. Six just arrived from Netflix. I will save it until I am suitably intoxicated. Just thought I’d stop by and get all curmudgeonly here. I watched the first Fast and The Furious a few nights ago, and thought it was pretty good for a dopey movie about LA street racing. Then I watched Fast Five last night. YAWN. What an incredibly boring movie. I thought it was Ocean’s 11 on quaaludes. Nothing happens! You have to wait two hours before they defy all laws of physics, gravity, and friction with their safe-dragging gag. Although I will give this to The Rock: he makes Vin Diesel look like Lawrence Olivier. That is because you are a danged fool. A) I TOLD YOU that you had to watch 2 Fast, 2 Furious, Tres Fast, Tres Furious, and Fast & Furious Four Real You Guys, before you watched Fast 5.
b) You DIDN’T and so you don’t appreciate how sublimely idiotic it is to have all of these characters you don’t know and wouldn’t want to know and certainly, if you did know them, wouldn’t want involved in some grand heist scheme which you’re just going to abandon anyway. Nothing happens in ANY of these movies, except for when it does. They are like koans; mystical riddles that to solve would be to know oneself purely. What is the sound of one Vins Diesel thinking? When you only saw one set of footprints on the beach? That’s when Michelle Rodriguez was CARRYING YOU. If a Rock falls, alone, in a forest, does he make a sound? You are judging this as if it were a movie. It is not a movie. It is like watching your mentally deficient children finally learn how to walk, even if they do reliably keep walking into the same wall the same way.